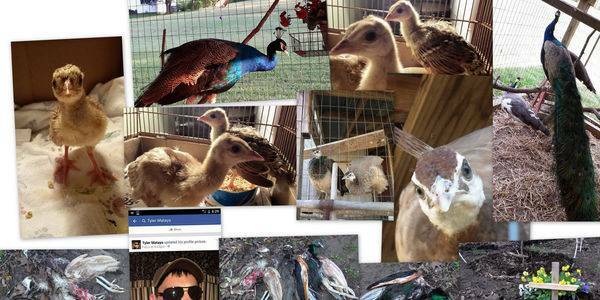 Laura's hand-raised peacocks were incredibly precious to her - beloved members of her family. That's why it was so horrifying when her home was broken into and the thief brutally killed her three birds...Mr. Blue, Bebe and Cece. The FBI flags these types of crimes as indicators of possible future criminal behavior, so it's important for Laura and for all of us that the local prosecutor seeks the maximum punishment. Thankfully, the local Sheriff's department was able to catch the criminal, return Laura's property and charge the individual with four felony counts. While none of this will bring back Mr. Blue, Bebe and Cece, Laura needs support to demand justice for her peacocks. Animal abuse cases are often deprioritized by prosecutors, so we need to speak up. Sign Laura's Care2 petition to the prosecuting attorney right now. The preliminary hearing has been set for early May, and Laura is planning on hand delivering her petition to the prosecutor just before that date, so we don't have much time. A man entered my home and stole several items. He then went to our coop and viciously tortured, mutilated & killed 3 of my pet peacocks. He tore at them. He ripped their feathers away taking hunks of flesh with them. He chopped at them & beat them into a pulp with a garden tool, so violently, the tool broke in half & the sharp edge was covered in blood. Mr. Blue (male) & my two 8 month old babies, Bebe & Cece, that I hand-raised in my home, are gone forever. As to why he did these horrible acts, his excuse was that he took a couple of Xanax & blacked out. I, nor many reasonable people, believe this excuse. As of January 2016, the FBI is now considering animal cruelty and tracking it as they would arson or homicide. These "Crimes Against Society" are good indicators as to a person's future behavior. I need your help with this petition to respectfully request that the Prosecuting Attorney's office makes no deals with Tyler Mataya. To request that they seek the maximum penalty under our laws for all 5 of the crimes Mataya is charged with. The max would be 19 years, however, with our systems and prisons the way they are, society would be lucky if Mataya served 5-7 of those. Anything less would be unacceptable in my mind. Also, I intend to forward this petition to the Judge who handles this case to, hopefully, be used in the penalty phase for sentencing. Thank you for taking the time to sign this petition & PLEASE pass this along/SHARE with your friends and neighbors so that they may also sign.